Very nice racket, good control. Received in time in good condition. Very good quality. Excellent product. Öncelikle Tabletennis11.com a çok çok teşekkürlerimi sunar, çalışmalarının devamını dilerim. Ürün 7 gün içinde elime ulaştı. Kargolama ve gönderim çok çok hızlı. Ürün orijinal ve tahminimden de harika çıktı. Bu fiyata harika bir ürün. The Racket is perfect, it's very fast and has good spin, however, you should have a great control to win with this racket. The Yasaka Racket is excellent. I am improving and enjoying my game. I'm very happy with this racket. I need some more time to get used to it, specially with my backhand (I hit too hard, I should make a better gesture). Overall, I like the sensation of playing with this combination of racket and rubbers. Not so speed as stated, fine control, a good kit for this money. Separate grateful for the timely gift - bag, and fast delivery to Russia! Feels great in the hand, good weight and has a bit more speed that I am used to. Excellent price and coupled with TT11's bulk discount and free shipping I was very happy with this. It arrived in New Zealand in about 3 days - incredible speed. Mark V has been mine and many players favorite since many years. Consistent rubber with medium to high speed and ball always goes where you want it to go. The Carbon blade gives extra kick for away from the table but best result are close or mid from the table. Yasaka has good quality, overall fit for new to intermediate level players with lots of control and moderate speed. Excellent service delivery and packaging by tabletennis11.com. I am a ping pong hobbyist. I used to play defense/counterattack. This racket allowed me to open up my offensive game. It is fast, but, when I need a spin, I get a spin. It is a bit top heavy. It took me a week to adjust to that. Even after decades of its presence in competitive table tennis, yasaka mark v is still an amazing racket. I was confident of the rubber all along but was unsure about the blade. However I was pleasantly surprised with the blade. Racket is light, easy to maneuver, works like a charm. Great racket for advanced intermediate aggressive game play with reliable spin and speed. Control is above average but comes with practice. Üniversitede öğrenci iken YASAKA MARK V ile oynuyordum. uzun yıllar sonra tekrar masa tenisi oynamaya başlayınca Yasaka racket MARK V CARBON almaya karar verdim. Şimdi raketin hızına yetişmeye çalışıyorum. oyununda Atak ve spini sevenler için güzel bir raket. bu arada tabletennis11.com raketten daha hızlı. perşembe günü siparişi verdim, cuma güne kargoya verildi mesajı geldi ve cumartesi günü İstanbul'a gelen raket pazartesi eve teslim edildi. teşekkürler YASAKA ve teşekkürler tabletennis11.com. I vas playing with YASAKA MARK V while a student at the universitiy. 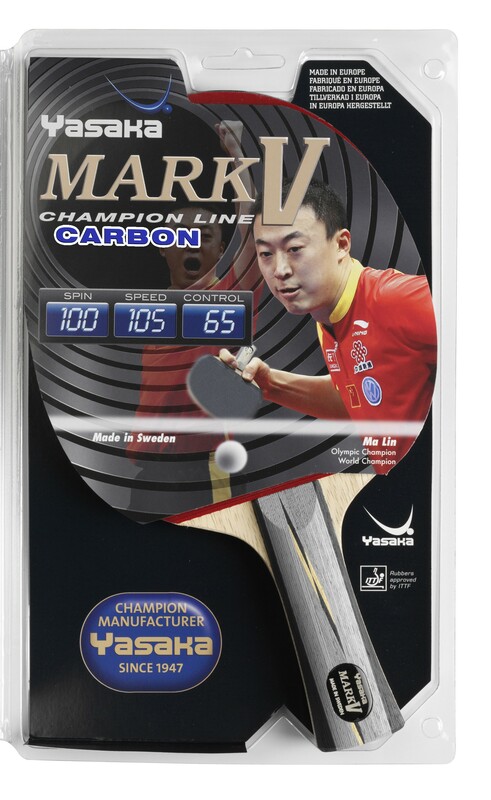 I decided to take Yasaka racket MARK V CARBON and I ordered one from tabletennis11.com. Super fastly racket came on three-days.Thank YASAKA and thanks tabletennis11.com. The packaging was exactly as per the picture (which was bad as per me. I was expecting it to be in a box or something). I would recommend to buy this recket. Superb grip feel and control over the ball. As is expected from the Yasaka class. Overall this is a good racket, everyone is happy in our group who bought this one. However, one racket was broken from the handle. Tabletennis11 agreed to refund the paddle after I send them a message. I have to say that Tabletennis 11 is the best regards to the service ! Their service is Excellent. Highly recommended. The racket is great, got good control and the grip is the best of any racket I had in the past. Overall I am very happy with my purchase and the responsiveness of the company. Racket head is a bit heavy. Overall it is good for an intermediate player . Thank you. It took more time than what I expected, but is a great racket. Good price and very very very good racket. I have ordered for this racket and was bit concerned about their shipping to USA. But, overall shipping took about 9 days which is fine. Price is competitive. About the Racket, I am more of offensive player, so on the one side I feel its pretty good with speed but the otherside I still dont feel the speed. Not sure if the glue on the otherside has some issue(I see some inconsistency on the edges of black side). Spin is yet to feel than the normal way. Overall satisfied, but for the price of the racket I expected more. Transition from my old cheap racket to Yasaka Mark V Carbon has certainly helped me enhance my game. The rubbers have excellent grip that put a nice spin on the ball. The racket's rated speed is just right for an accurate and strong smash, too. It is difficult to find fault with this racket. It's price is very competitive and tabletennis11.com delivered it to me in London in just 4 days. I ordered yasaka mark 5 carbon on Monday from the city of winnetka, South California and surprisingly, the product was delivered the following Monday in good condition. Fantastic job !! I enjoy my yasaka. Thank you very much for your service!! I ordered this racket and at first I was a bit apprehensive because I never ordered anything overseas. But the people at Tabletennis11 were very communicative via email and I got my racquet within 10 days. The racket is great, got good control and the grip is the best of any racket I had in the past. Overall I am very happy with my purchase and the responsiveness of the company. Good store, great seller! Fast Shipping! Добрый день. После приобретения данной ракетки поиграл ей очень мало, и поэтому пока не понял как ей играть. Ожидания были очень большими, не знаю боюсь разочароваться. Just getting back into table tennis after 10 years away. Decided to go for the Yasaka Mark V the bat i had as a teenager. Great price and fast delivery cant fault anything. I am a hobbyist today. It was a nice surprise to find this bat after decades. I've been to many MarkV bats at seventies and eighties. This feels a little bit different (or am I different :D), but I am happy with this. Not much speed or spin, but control is OK for me. Thank you! Online order was easy to set up, I placed order from USA but delivered in very short time (8 days) with nice and protected cover. I liked the ball pen they gifted along with three TT balls. Good Deal overall. Out of the rackets I've tried so far (which have been mainly 4 and 5 star stiga rackets) This is truly the best one. It has Excellent spin, The Control is as to be expected. And the speed is pretty good too. (there is ofcourse rackets with even more speed then this, but it's a matter of preference. You'll have to get used to it ofcourse. Very good price. Fast delivery to Sweden and a great product! This is racket is a classic. 5 Stars!